Nov 1, 2004 - Department of Electrical and Electronics Engineering, Atilim ... Abant Izzet Baysal University, Duzce Technical Education Faculty, Bolu, Turkey. 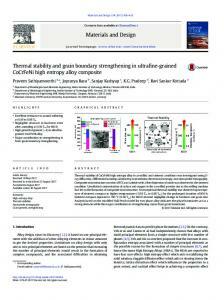 alloying elements, dislocations and grain boundaries enhance strength and stabilize ultrafine microstructures. Furthermore, for an HPT sample heated beyond 210 °C, the formation of nanoprecipitates also contributes to hardness increment. The multimechanistic model for hardness contribution indicates the short-range order strengthening due to cluster-defect complexes is the dominant mechanism, which accounts for more than 40% of overall hardness. kind of alloys. The aim of this work is to investigate solute redistribution, evolution of dislocation density and nanoscale precipitation during linear heating of HPT-processed AA2024 alloy, mainly using APM and X-ray diffraction line broadening. 2. Experimental procedures UFG Al-4.63Cu-1.51Mg (wt. %) (AA2024) samples were processed by HPT for five revolutions (5r-HPT) at room temperature, under a pressure of 6 GPa with a speed of 1 rpm. The composition of the alloy is shown in Table 1, and the as-received specimens were in the T351 temper. Prior to HPT, the samples were cut to discs with a diameter of 9.8 mm and mechanically ground and polished to 0.83~0.85 mm in thickness. Details of the HPT processing were explained previously [9, 38]. APT analysis was carried out under an ultrahigh vacuum (∼1 × 10−8 Pa), UV laser pulsing energy of 40 pJ at the pulse repetition rate of 200 kHz and a specimen temperature of ∼20-25 K using a local electrode atom probe (LEAP4000X SI®). Reconstruction and visualization of APT data was performed using the Imago Visualization and Analysis Software (IVASTM 3.6.2) . 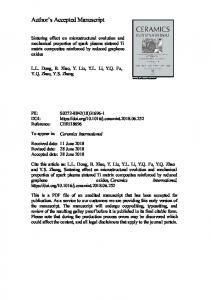 The maximum separation algorithm was employed for cluster identification, with Mg, Si and Cu as clustering solutes and a separation distance of 0.5 nm [22, 23]. The cluster sizes represent the number of solute atoms in the detected clusters. A minimum cluster size of n = 2 was employed to detect extremely small solute clusters . 3. 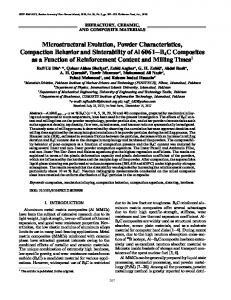 Results and Analysis 3.1 The DSC and Vickers hardness measurements In Fig. 1, the DSC thermogram of the T351 sample has an endothermic reaction at 100~240 °C, whilst 5r-HPT sample shows an exothermic reaction with peak at 170 °C. In the intermediate temperature range, the T351 sample shows a single exothermic peak at 260 °C, whilst the 5rHPT shows two overlapping exothermic effects, peaking respectively at 210 °C and 240 °C. These exothermic effects are primarily due to the formation of variants of the S phase . The high temperature endotherm (from about 270 °C to 490 °C) is mainly due to the dissolution of S precipitates. A significant amount of stored energy is released as microstructures evolve on heating. The hardness evolution in DSC annealing with heating rate of 10 °C/min is shown in Fig. 2. The microhardness increases significantly after HPT process: the Vickers hardness of the HPT sample is ~70% higher than that of T351 (142 HV). On heating, the hardness of the HPTprocessed sample increases slightly from 243 HV to 263 HV when heated to 140 °C, where exhibits an exothermic peak in DSC (Fig. 1). The microhardness of the 5r-HPT sample decreases significantly when heated beyond 210 °C; and the decrease in hardness for the T351 sample occurs from temperature above 260 °C. Both samples have similar microhardness when heated between 300 °C and 400 °C. 300 °C evidences the precipitation reaction. The differences of relative peak intensities indicate HPT processing changes the textures of the alloy. The broadening of the aluminium XRD profile of HPT-processed samples is due to lattice defects, which are predominantly dislocations and (additional) grain boundaries. In cubic crystals, anisotropic peak broadening may occur due to anisotropic crystallite shape, anisotropic strain or planar defects, which are caused by dislocations, stacking faults, twinning and stress gradients [47, 48]. Crystal twinning does not normally occur in aluminium alloys due to their high stacking fault energy, and compared to other metals, i.e. Cu or Ni, anisotropy effects are small in aluminium alloys. Hence for the present samples anisotropic peak broadening is assumed to be negligible. where b is the Burgers vector, 0.286 nm, for an fcc Al alloy, Dc is the crystallite size. Fig. 4(b) illustrates the dislocation density evolution of the 5r-HPT samples heated to various temperatures. to 210 °C (5r-HPT-210 °C), and increases to 250±40 nm on heating to 300 °C (5r-HPT-300 °C). The SAD pattern in the 5r-HPT sample, shown in Fig. 5(a), indicates the presence of many grains, compared with the 5r-HPT-210 °C and the 5r-HPT-300 °C samples (Fig. 5(b) and (c)). The grain size of SPD-processed materials determined by TEM is several times larger than the crystallite size (or coherently scattering domain size) obtained by X-ray peak profile analysis [51, 52]. 3.2.3 Solute segregation and clustering The 5r-HPT sample and the samples subsequently subjected to equivalent annealing have been analysed by APT. The cluster number density (CND, the number of clusters per unit volume) of different types of clusters and their fractions of number density to overall clusters obtained by APT are shown in Table 2. Linear profile analysis across GBs in Fig. 6 and Fig. 7 has been conducted; a typical one is shown in Fig. 7b. The solute concentrations at the GB are significantly higher than those values in the matrix of two grains on either side of the GB, confirming that there is segregation of solutes at the grain boundary. All grain boundaries were identified due to their 2-D curved plane features by carefully visual examination of the analysis volume in different view directions. The solute-enriched features in the volume element of the 5r-HPT sample (Fig. 6) involve: (i) a segment of grain boundary; (ii) a uniform distribution of fine scale solute-rich clusters (containing up to 50 solute atoms) with a number density of 1.99×1026 m-3 (as determined from the total number of solute clusters identified in the analysed volume). The vast majority of the segregants are Cu, and a small but a significant minor concentration of Si and Mn is also evident in the corresponding atoms maps. The segregation of Mg atoms is not so obvious as other atoms, because Mg atoms are absent in Mn-rich particles and more homogenously distributed within the grains. results (Fig. 3) this precipitate is identified as S phase (Al2MgCu). On heating, the total cluster number density decreases significantly to 2.42×1025 m-3, while the density of Cu-Mg co-clusters, which is the majority of the clusters, decreases to 1.22×1025 m-3. APT work on a solution treated and aged 2024 Al alloy shows that solute clusters form during ageing by aggregation of the main alloying elements Cu and Mg, along with the minor elements Si and Zn . In the HPT-deformed samples, the clustering phenomenon is similar . The main alloy elements Mg and Cu concentrate along the grain boundaries or dislocation walls together with minor element Si. The size of the nano-precipitates increases as the annealing temperature increases. small contribution to overall strength, accounting for up to 4% to overall strength. where μm is the shear modulus of the matrix, ν the Poisson’s ratio for Al, ds is the diameter of the cross-section of the S-phase precipitates and fs is the volume fraction of S phase , which is determined in the Appendix. The diameter of the cross-section of S precipitates were determined from APT data as 10 nm and 50 nm for 5r-HPT sample annealed at 210 °C and 300 °C. The table shows a good correspondence between measured and predicted total hardness, which further supports the present model. Thus the present approach provides a coherent explanation of the hardness of the present complex SPD processed alloy on the conditions both after HPT and after subsequent heating, revealing the relative importance of the various strengthening mechanisms. In particular, the model shows that for samples where the maximum exposure temperature is 210°C or lower, the solute/cluster-defect complex hardening is the dominant mechanism, contributing an increase of ~100 HV, over 40% of the total strength. cluster-defect complexes form and enthalpy for a dislocation passing through Cu-Mg-defect clusters increases to 50 kJ/mole . The ΔHCu-Mg-dis may vary somewhat during heating, as the dislocation density slightly decreases (see Fig. 4(b)) and part of the Cu-Mg clusters dissolve into the Al matrix. The microstrain increases on heating to 120 °C as shown in Fig. 4(a). This is due to the interaction between dislocations and dissolved Cu/Mg atoms, when dislocations pass through and break down Cu-Mg clusters to smaller clusters. As a result of increasing atom diffusion coefficient for a UFG Al alloy in DSC heating process, more clusters are segregated to grain boundaries, and then the proportion f4 of cluster-defect complexes increases. 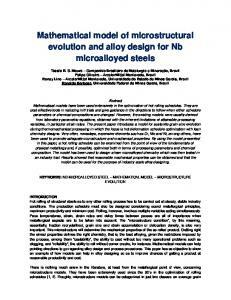 Finally it is noted that the mechanism of strengthening in nanostructured Al alloys discussed by Valiev et al [75, 80] indicates the effect of solute segregation on the emission of dislocations from the grain boundaries results in an additional strengthening and a positive deviation of HallPetch slope kHP, which is 0.13 MPa/m1/2. 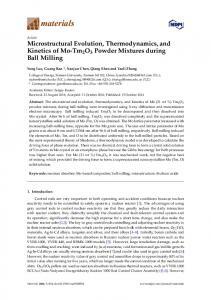 It shows a good agreement with the Hall-Petch coefficient in Al-Cu  and Al-Mg-Si alloys . This may be interpreted as an indication that in the alloys studied in those works the solute-grain boundary interaction is the dominant solutedefect strengthening effect. Whilst these works [75, 80] on an experimental formula between grain size and strength is valuable, a modified Hall-Petch slope in itself does not clarify the nanoscale mechanisms responsible for the strengthening effects. The analysis in the present work shows a clear evidence that the nanoscale mechanisms play a role in a ternary alloy. clusters segregate to the UFG grain boundaries and dislocations. As a result of precipitation, the cluster-defect complexes disappear as heated beyond 210 °C. 3. The analysis of contributions of hardness indicates short-range order due to the cluster-defect complexes is the dominant mechanism, contributing to ~100 HV for samples heated up to 210 °C. The hardness due to the microstrains related to defects in lattice (i.e. dislocation and grain boundaries) contributes the second hardening component (totaling ~90 HV). Solute hardening and modulus hardening contribute very little. A precipitation-hardening component from Orowan bypass mechanism occurs due to S phase formation. where fmax is maximum value that fo can take, i.e. when all elements would precipitate. Thus the maximum volume fraction of S phase fmax is equal to the fraction of Cu-Mg co-clusters, which is 0.018. cs is the composition of the alloy, c0 is the equilibrium concentration and expressed as . the S phase precipitates at 260 °C if xMg is 1.5wt.%. It is consistent with the DSC thermogram of a 2024 Al-T351 sample in Fig. 1. This analysis suggests that Ts equals 260 °C. Published as: Acta Materialia 109 (2016) 202-212. DOI: 10.1016/j.actamat.2016.02.050  R.Z. Valiev, N.A. Enikeev, M.Y. Murashkin, S.E. Aleksandrov, R.V. Goldshtein. Superstrength of ultrafine-grained aluminum alloys produced by severe plastic deformation, Dokl. Phys. 55 (2010) 267-270. G. Sha, H. Möller, W.E. Stumpf, J.H. Xia, G. Govender, S.P. Ringer. 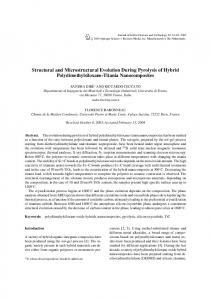 Solute nanostructures and their strengthening effects in Al–7Si–0.6Mg alloy F357, Acta Materialia 60 (2012) 692-701. G. Sha, K. Tugcu, X.Z. Liao, P.W. Trimby, M.Y. Murashkin, R.Z. Valiev, S.P. Ringer. 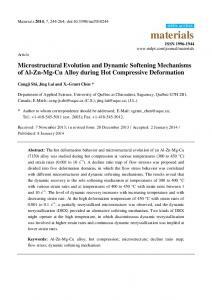 Strength, grain refinement and solute nanostructures of an Al–Mg–Si alloy (AA6060) processed by high-pressure torsion, Acta Materialia 63 (2014) 169-179. P.A. Flinn. Solute hardening of close-packed solid solutions, Acta Metallurgica 6 (1958) 631-635. 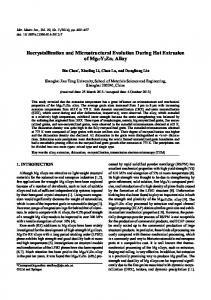 M. Liu, S. Bai, Z. Liu, X. Zhou, P. Xia, S. Zeng. 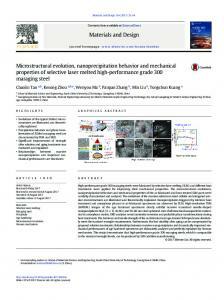 Analysis of modulus hardening in an artificial aged Al– Cu–Mg alloy by atom probe tomography, Materials Science and Engineering: A 629 (2015) 23-28. R.Z. Valiev, N.A. Enikeev, M.Y. Murashkin, V.U. Kazykhanov, X. Sauvage. 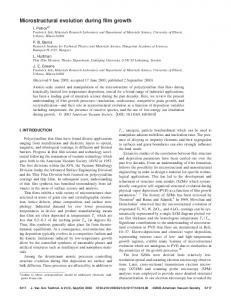 On the origin of the extremely high strength of ultrafine-grained Al alloys produced by severe plastic deformation, Scripta Materialia 63 (2010) 949-952. A. Loucif, R.B. Figueiredo, T. Baudin, F. Brisset, R. Chemam, T.G. Langdon. Ultrafine grains and the Hall–Petch relationship in an Al–Mg–Si alloy processed by high-pressure torsion, Materials Science and Engineering: A 532 (2012) 139-145. A. Deschamps, A. Bigot, F. Livet, P. Auger, Y. Bréchet, D. Blavette. A comparative study of precipitate composition and volume fraction in an Al–Zn–Mg alloy using tomographic atom probe and small-angle X-ray scattering, Philosophical Magazine A 81 (2001) 2391-2414. V. Raghavan. Al-Cu-Mg (Aluminum-Copper-Magnesium), J Phs Eqil and Diff 28 (2007) 174-179. 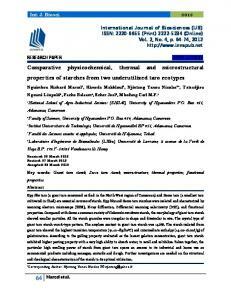 Report "Microstructural evolution, strengthening and thermal ..."